How sweet! 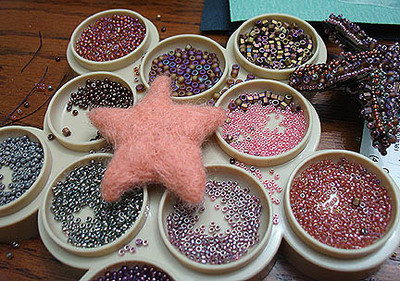 Lori over at Best Indie Shops picked humblebeads.com as the cool indie shop of the day. Darn, now that I put up the banner here, does that mean I'm not humble anymore? Where does the name humblebeads come from? They are humblebeads based on the humble material they are created from: poor underrated polymer clay. It's been the beadmaking world's homely little sister. But like any Cinderella story, she's just a diamond in the rough waiting for a talented fairy godmother to transform her into beautiful art beads. Oh, I like being the fairy godmother. We grew up living next door to my Great Grandmother. If we were lucky on weekend mornings she would walk across the yard with a neatly wrapped package in tin foil. Inside would be a still-warm loaf of banana or zucchini bread. Some days it would be 6 perfect blueberry muffins, made with Michigan blueberries and sugar sprinkled on the top. The first one is my Great Grandmother and her cooking. One Thanksgiving she made 13 pies, from scratch! Do I want to spend hours and hours cooking? Not really, but my grandma thoroughly enjoyed cooking for others and I do too. I like when we have family and friends over for meals and I like taking the time to make good food for Jess and the girls. The second influence was my best friend's mother. She made sure everything in their home was something beautiful that they enjoyed. Definitely a quality over quantity type family. They also greatly appreciated the handmade and valued artistic expression in home decorating. The third was my Step-Mother Donna. Who has spent her entire life devoted to her family. Time with family is the most important part of the day. Every night she and my dad would finish the day with a hot cup of tea. I'm sure they still do. If they watched TV it was an activity that they would do together, even then it would be a family movie, usually rated PG. The TV was never on as background noise. You are much more likely to find a book in their hands than a remote control. Donna also makes sure every holiday and celebration is focused on keeping her family's thoughts towards the spiritual. I find that each one of them has influenced how I live my day to day life and how I celebrate the holidays. Enjoying the simple pleasures of family, nature and creating are good values to have inherited from these women. 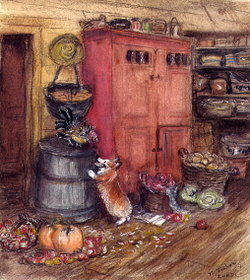 If you are wondering about the image, it's from Tasha Tudor, who is the epitome of simple living. Seriously, doesn't this look like a little slice of Art Heaven? I've wanted to attending this art school retreat since I was in high school. It's sponsored by the Art Institute of Chicago. But what do I really want? A week of no responsibilities with the goal of exploring my creative thoughts in a relaxing, beautiful, in tune with nature atmosphere. And surrounded by other creative types for inspiration. Hmm, could I manage that without the trip to Michigan and paying the outrageous tuition? Wouldn't it be cool to rent a cabin for a long weekend with a few other artist friends, bringing along our supplies and spend the days creating. I need an art retreat. Hmm, I could put one together. I have 3 art families in mind who would probably enjoy the retreat too. Oh, I'm in trouble now. Traveling across country in an RV teaching all over the states. Starting an art day camp for kids for the summer. Talking Jesse into quitting his job and living the artiste boheme life with me. Signing up for crappy market days, because I miss the torture of outdoor art shows. Opening a bead shop/gallery in my hometown of South Haven. Spending one weekend every month this summer at one of the little hill country towns for mini-vacations. A weekend in South Padre Island. How do you balance wanting a better life, but enjoying every minute that is set before you? I'm trying. I'm thankful and happy and I do have a great life. But there are times when I want something more. Somedays thoughts of living back home and not in Texas overwhelm me. I heard once that during WWI, Russian soldiers were so homesick that they weren't able to fight. They labeled it nostalgia. Longing for the past and what was. Of course the cure was to be shot, so that doesn't help much. I want to live near the beach in Michigan. I want Jesse and I to both be able to work and live as artists. I want to raise my girls in a small town. I want to live a simpler life, with less pressure and stress. I want to be near my family. No matter what, home will always be home. Before I bore you to death with family vacation photos! Our Motel, right on the beach. Shopping and eating on the Strand, downtown Galveston. We added two new members to our family, Sam and Patrick, hermit crabs extraordinaire! Shopping at Mermaid Pier and Murdoch's Bath House. Fun, relaxing and breezy. It was a perfect weekend. Jess is now planning our next weekend coastal trip, Corpus Christi anyone? Of course, the ocean doesn't compare to the calm and peaceful shores of West Michigan!